What is Chevy MyLink? It’s the latest connectivity feature, and you’ll use it to access your smartphone, download apps, and more. It’s the multimedia center of your vehicle, and what it can do is only limited by the apps you add to it. How Can You Use Chevy MyLink? Chevy MyLink offers smartphone integration via Apple CarPlay and Android Auto, so you can access features, apps, and your contact list as you drive. Alternatively, you can head straight to the Chevrolet Shop to browse and install apps for audiobooks, music, and more. 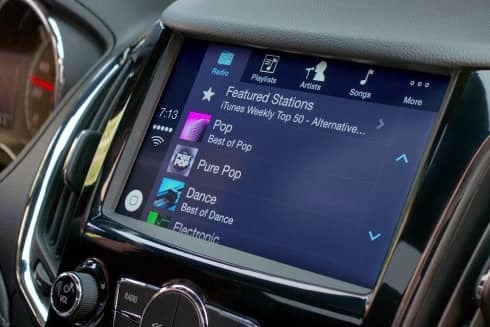 Some of the most popular options include SiriusXM, Pandora Internet Radio, and Stitcher. When you lend your car to your kids, available Teen Driver technology can make sure they wear seatbelts, turn on certain safety systems, keep the music down, stay under a certain speed, and more. Over-the-Air technology sends Chevy MyLink software updates over a wireless connection. An internet connection through built-in 4G LTE or other secure Wi-Fi hotspot. To accept the connected vehicle user Terms and Conditions and Privacy Statement for your vehicle. Once you press Download/Install you can continue to use your vehicle normally as the software downloads. Once downloaded, you’ll be prompted to accept the installation of the update the next time you turn your vehicle on or shift it into PARK. During most updates, the vehicle will be disabled. The average time is 20 minutes, and you don’t need to remain in the vehicle. Whether you want a compact sedan offering Teen Driver Mode for trips across Naperville or an SUV with in-built apps for commutes between Aurora and Bolingbrook, you’ll find a wide selection of Chevy MyLink models in our new Chevrolet inventory. To find out more, don’t hesitate to contact us today. 0 comment(s) so far on What is Chevy MyLink?